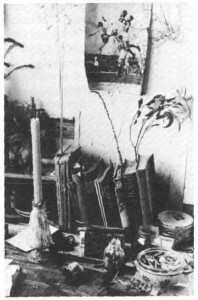 There’s a marvellous photograph of a corner of Sidney Nolan’s studio taken in 1949. 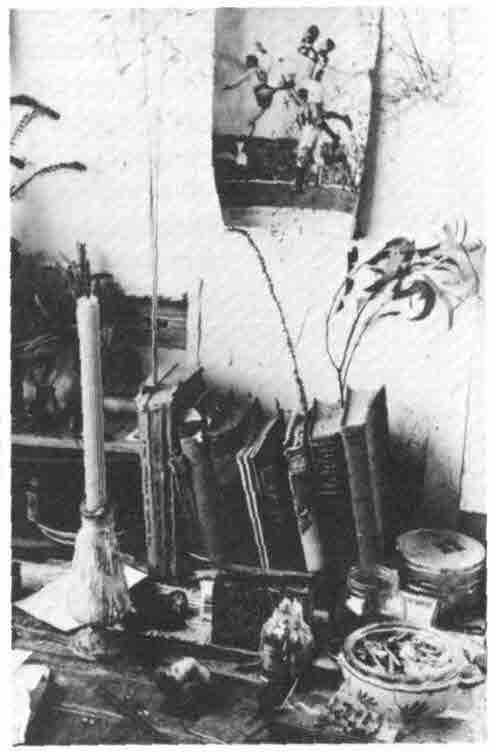 On a small work table are the usual trappings of the bohemian laboratory: tobacco tin, overflowing ashtray, dog-eared books, and candlesticks picturesquely caked in melted wax. The only unfamiliar element in this ad hoc still life is a photograph pinned to the wall above the table: in it, a Collingwood footballer takes a huge grab, sending a hapless South Melbourne player sprawling before him. What was Nolan up to? Typical studio décor demanded inspirational art postcards; talismans of the European avant-garde, reminders that the artist’s mission was to struggle against the twin antipodean tyrannies of distance and complacency. Not so for Sidney. Having already discovered an Australian anti-hero in Ned Kelly, he seems to have found another in Saturday’s warriors. Both were equally affronting to refined sensibilities: the one, a nineteenth-century terrorist; the other, a twentieth-century athletic pin-up. And then there’s the television documentary, a paean to the returning hero shot in the 1970s, which shows Nolan attending a football game in Melbourne. There in the stands is Nolan, munching on a pie, engrossed in the game. The temptation to call this traffic between studio and stadium incongruous has to be resisted. It arises from the Manichaean view that’s plagued the arts in Australia, a view that divides the world into mutually exclusive groups; artists and players, pansies and jocks, cultural sophisticates and sporting Neanderthals. The divide has been policed with equal fervour by both sides. For Donald Horne, determined to lift the tone of national life, a love of sport was a sign of Australian infantilism. ‘The whole business of human striving becomes a game’, he lamented in The lucky country. Equally, in the sporting world, football players with a literary bent, like Ted Hopkins and Brent Crosswell, were treated as anomalies; a Rhodes Scholar like Mike Fitzpatrick was a freak. Some of the blame has to rest with cultural commentators of the 1960s and 70s; writers like Horne, Craig McGregor and Ronald Conway who lamented Australians’ passion for bread and circuses. Robin Boyd, one of the key tastemakers of the post-war era, declared in his Australian ugliness that he could think of few experiences more grotesque than standing in the outer at the football, consuming a large can of beer per quarter. Odd then, that John Brack’s Three of the players (1953), a stiffly hieratic painting of three Collingwood footballers, hung above the dining table in Boyd’s own South Yarra home. I wonder what it meant to him? Were the footballers a reminder of the ugliness against which he campaigned? Or did he find some reassurance in the work, a certain relief that a painter of Brack’s stature could take on the enemy and come out ahead. I suspect the latter; Brack’s strangely Egyptian players read as hollow idols. Stilted and gormless, they are harbingers of today’s young recruits, all jaw and hair product. If we step back from this minor antipodean culture war, we find that, as a general rule, artists of all kinds are relaxed about sport. Like most of us, they see sport as a recreational spectacle. Jack Kerouac’s diaries, for example, make the occasional glancing reference to his attending baseball games. No fuss about it, just a good day at the ballpark, flushing out the cobwebs before returning to the kitchen table for another late-night writing session. Desperate to make good progress on On the road, Kerouac logged in his diary the number of words written per day, constantly analysing his performance, seeking to improve on the previous bout. So, ironically given the myth of Kerouac’s stream of consciousness writing practice, his diaries are larded with that maligned sporting phenomenon; statistics. It’s here, in the figure of training and discipline, that we find one of the most common parallels between art and sport. Ask an artist what their work means, or what it is about, and, like a sport player, they’ll talk about process and practice: the tasks they undertook, the equipment they used, the time they devoted to it, the moments of success and failure. In a recent profile published in the New Yorker (9 June 2008), Japanese novelist Haruki Murakami anchored his entire career as a novelist to sport. Murakami recalls the precise moment at which he decided he could write a novel. He was lying on the grassy outfield bleachers of the Yakult Swallows stadium, watching a baseball game, sipping a cold beer. (A curious contrast with Robin Boyd, but the relationship of art, sport and beer is another story.) Later, having committed to the sedentary profession of writing, Murakami took up running to keep his weight down. Of course, being Murakami, these casual autobiographical fragments have a metaphorical thread. The best creative decisions, he suggests, are made away from the formal realm of creativity, in the domain of art’s close cousin, play. And the best creative trajectory is achieved when one adopts a disciplined daily regimen akin to the athlete in training. 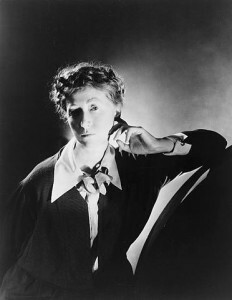 Marianne Moore (1887–1972). Photograph by George Platt Lynes, 1935, gelatin silver, 22.8 x 17.7 cm. Library of Congress. Marianne Moore, the Brooklyn-based poet laureate of baseball, captured another great parallel between art and sport: ‘Fanaticism? No/Writing is exciting/and baseball is like writing/You can never tell with either/how it will go/or what you will do’. Exactly. What artists like is a field in which to play; a few rules to shape the activity and the constant possibility of running full tilt into the unknown. Sport has precisely the balance between control and possibility that Marcel Duchamp (a competitive chess player as well as a conceptual artist) called ‘canned chance’. Moore identified what was keeping art and sport apart; ‘we do not admire what we cannot understand . . . a wild horse taking a roll . . . a baseball fan, a statistician’. The only poet ever invited to throw the opening pitch of a baseball season, Moore understood, admired and celebrated not only baseball players, but fans, radio commentators and coaches. I can empathise with Murakami and Moore, having visited some of the great baseball stadiums of the United States. About ten years ago, I was sitting in Yankee stadium on the 4th of July, hot dog in one hand, plastic cup of watery beer in the other. The string of rev-’em-up rock anthems playing over the PA came to an abrupt when the Ramones’ ‘Blitzkrieg bop’ began blasting across the outfield: ‘Hey. Ho. Let’s go! Hey. Ho. Let’s go!’ The perfect downtown icing on the wedding cake architecture of Yankee Stadium. And, for me, the encapsulation of everything strange and enticing about New York City: a moment when I realised how hard I’d been working to resist acknowledging that America was my second home. There are those who find such reflections an affront to sport. In their introduction to The Picador book of sports writing, Nick Coleman and Nick Hornby rail against the ‘common misapprehension’ that sport is ‘a metaphor for real life … as if sport has something to tell us in the same way that art does’. This is a new twist in the campaign to maintain the segregation of art and sport. As sports writing grows in ambition and complexity, as international artists such as Mark Wallinger, Douglas Gordon and Roddie Buchanan make sport the stuff of the Venice Biennale, there are now sport fans who would protest the union. Sport, Coleman and Hornby insist, ‘has all of life’s business in it and no meaning’. Sport just is, and means nothing other than itself. The claim is like a strange paraphrase of Oscar Wilde’s declaration that, ‘All art is quite useless’. The mistake of artists, and ambitious sportswriters, it seems, is to try to make sport and art do something. This is a bit rich coming from Nick Hornby, of course, whose stock in trade is making sport (and record collecting and not reading books) into a metaphor for life. But it does show that the resistance can come from both sides. What Birley calls the ‘aesthetic fallacy’ is seductive because it seems so readily to elevate the great athlete above the muck of the playing field, to suggest that Bradman or Ablett might somehow find their places on a Greek vase alongside the heroes of antiquity. But this is the same kind of over-compensation that likens Bob Dylan’s lyrics to poetry or the Beatles to classical composers. Such things don’t need to be called art in order to be esteemed. Sport is not art, and vice-versa. But both can be about life and its meanings. Original publication: ‘The games people play’, The Age, 26 July 2008, A2 section, pp 14–15.